Another Mary Cherry recipe…and another recipe I have never tried! So this challenge is truly fulfilling the intention of exploring recipe I haven’t tried before. 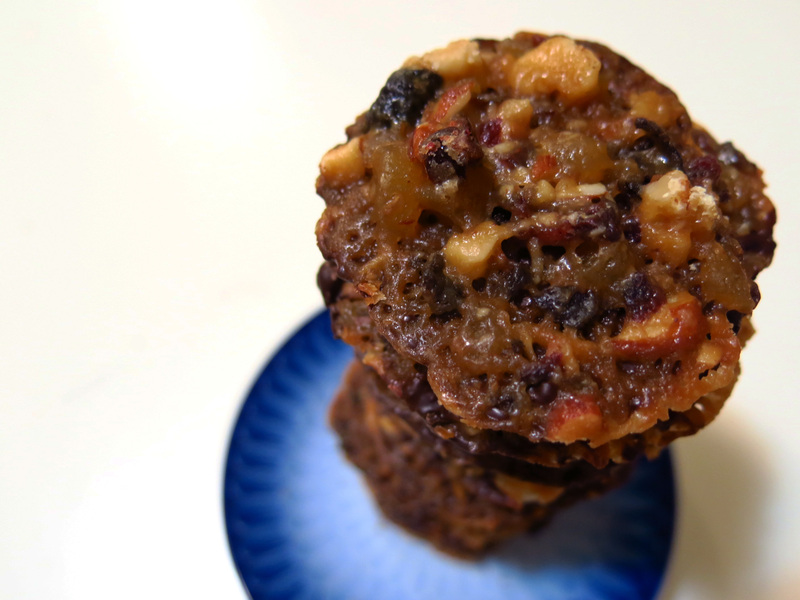 It’s a mixture of nuts and/or dried fruit in a caramelized batter that’s baked and then coated on one side with chocolate. I’ve actually seen these cookies in cafes and bakeries before but have always been too intimidated to try to make them. My fear of caramel I suppose… I do enjoy florentines quite a bit, especially the Trader Joe varieties which are branded as “Lacey Cookies”. They make them in two varieties – macadamia cookie in milk chocolate or almond cookie in dark chocolate. Both are excellent and both are loved by Mother Woo, haha. So I was actually quite excited to be ‘forced’ to make these cookies, if anything to be able to make them for my mom. It really did help watching the bakers make it on the show and analyze the recipe, although perhaps they read a bit too much into the cookie. Perhaps because I’ve seen/eaten these cookies before as well as tuile cookies, I understand the concept of the REALLY FAST BAKING COOKIE. Like, watch every last second – or else they’ll burn. Alternatively, don’t cook them enough and they won’t be nice and crispy. I think the only modification I made to this recipe was replacing fruit peel with candied ginger, which still added a nice zing. For me, the florentine was a bit too heavy on the fruit. I would have gone more nuts, haha! Either way, feel free to play around with the balance of nuts vs fruit. 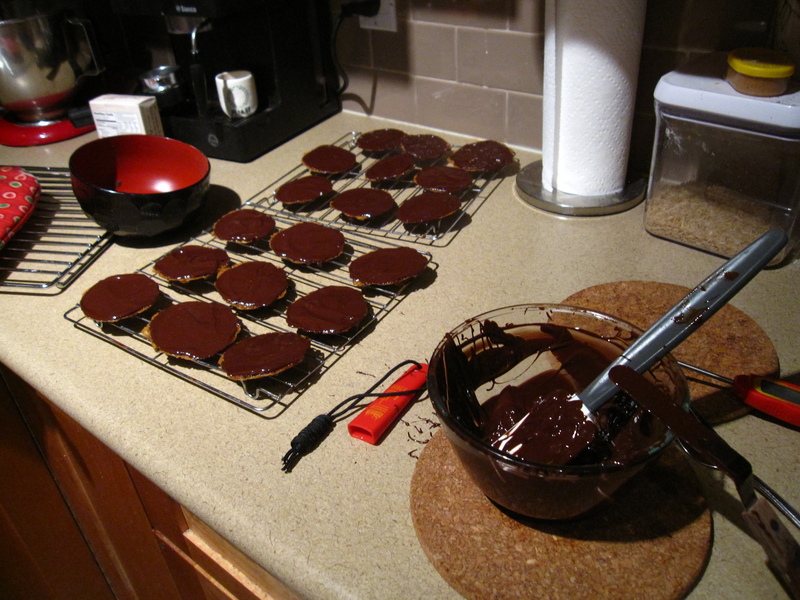 These make 18 decent sized cookies – as was specified in the show so I portioned the batter very carefully. It’s really just a tad over a tablespoon of batter per cookie – it’s not a lot but they spread! So when the bake, do watch them. When they start to bubble aggressively on the edges – they’re done. But make sure ALL of them are bubbling away. 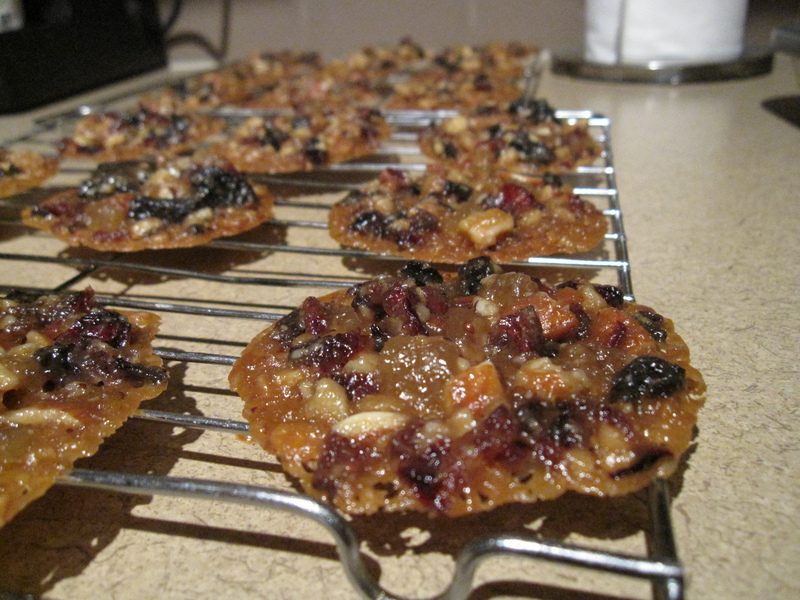 Uncoated florentines cooling. Waiting for them to crisp up and become less bendy, haha. In the recipe, there is also a method for a basic tempered chocolate and it’s not a bad way to go. I did take it one step further and raise the temp again – so I melted the chocolate, cooled it by seeding it with the unmelted chocolate and then heated it back up (which is technically the process for tempering chocolate). And although it wasn’t QUITE as glossy as I would like (thus a correctly tempered chocolate) – it still had a good snap and didn’t melt in your hand right away. So pretty close! There’s also a delicate timing to doing the chocolate detail on the back – the chocolate just has to be set enough to hold the swirl. Too warm and it just melts back and too cool and you can’t swirl it. It sounds more complicated than it actually is! Anyway, once they’re cooled…ta da! 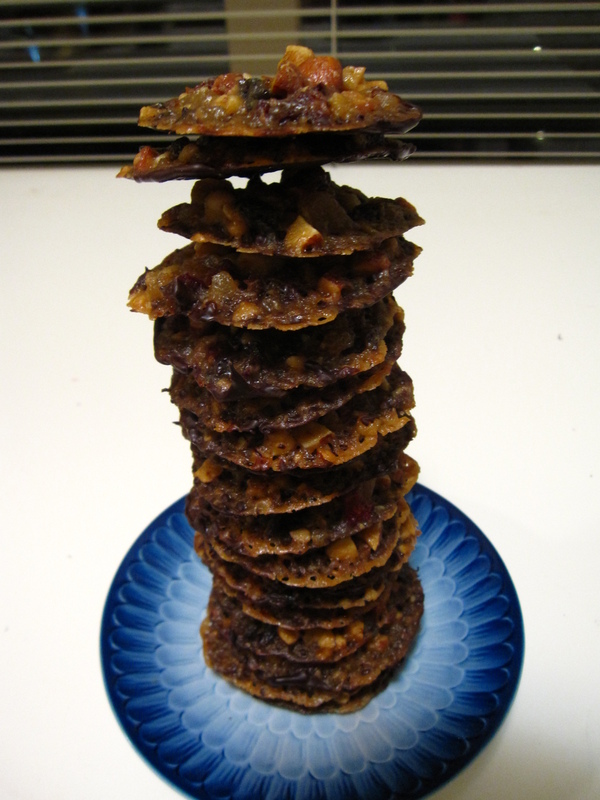 A fun shot of the stacked cookies. It was a tricky balancing act when you realize you didn’t chop all the fruits and nuts very evenly. This was a pretty easy recipe with great results!